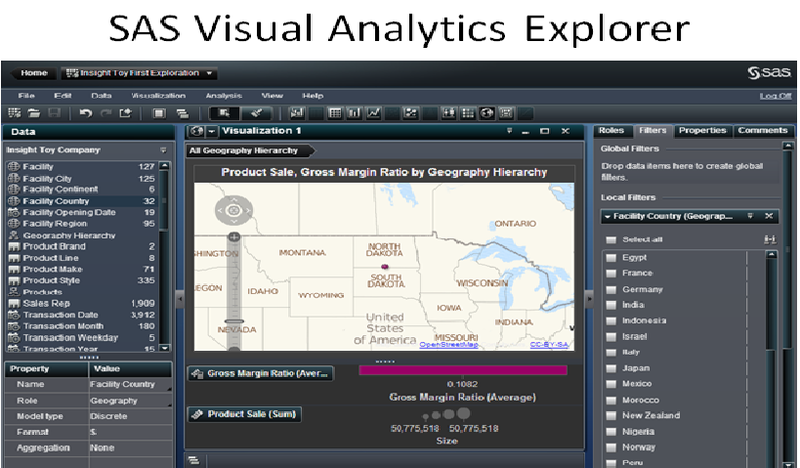 Project Description : The goal of this project was to analyze the SAS Visual analytics explorer, measure the experience delivered by the visuals or components and develop a prototype with our proposed changes.SAS Visual Analytics explorer is a tool that enables user to gain insight to user data, no matter how big the size of the data, with no need to subset or sample the data. In order to achieve our goals we first conducted a survey on the existing UI with 10 participants which comprised the first phase of our project.The survey was intended to collect the users view about the existing UI. Some of the common issues the participants encountered: Complex UI(not easily approachable) ,a very dark color scheme,absence of a work flow based model(absence of modular design). The survey results were analyzed in detail to understand the pros and cons of the existing UI. We used the results of the survey and then developed a new prototype of the UI in phase 2 .In phase 3 we evaluated the design-prototype with the new set of users as well as the participants of the initial survey.The enhanced features in our prototype were :A pleasant color scheme,a less complex interface, modular design.The preliminary analysis of the survey results showed that the users were pretty comfortable using the new prototype. They found the modular design to be helpful in navigating through the UI.